This simple combination of summer squash, onion, garlic, cheese, and eggs makes a quick and satisfying brunch, lunch, or casual dinner. Yellow summer squash works just fine in place of zucchini, although the yellow color blends in with the egg, resulting in a less stunning frittata. Feel free to play with the type of cheese and whether or not to stir in the herbs—frittatas are casual dishes meant to be used to make a meal out of what is at hand. Find more Easy and Delicious Zucchini Recipes here. In a large bowl, whisk the eggs and cream or milk until the egg whites are thoroughly broken up and the whisk lifted out of the bowl drips with no globs clinging to it. The mixture should be as thin, watery, and flowing as a glass of milk. Set aside. Trim and peel the onion, finely chop it. In a large frying pan, heat 1 tablespoon of the olive oil over medium-high heat. Add the onion and salt. Cook, stirring frequently until the onion starts to brown, about 5 minutes. Meanwhile, peel and mince the garlic. Trim the zucchini or summer squash, cut in half lengthwise, and thinly slice into half moons. When the onion has started to brown, add the minced garlic and cook until fragrant, about 1 minute. Add the sliced zucchini or summer squash and cook, stirring, until wilted, about 5 minutes. While that cooks, grate the cheese and mince the herbs. Stir in the cheese, herbs, and pepper into the eggs. Stir in the vegetable mixture. Return the pan to the stove. Add the remaining 1 tablespoon of the oil, swirl it to coat the pan, and let it sit until hot. Pour in the egg-vegetable mixture. Reduce the heat to medium-low. Cook until lightly browned on the bottom, about 5 minutes. Heat a broiler, arranging a rack 6 to 8 inches below the heating element. Put the frittata under broiler and cook, watching constantly, until the frittata is set and the top is browned, 2 to 3 minutes (your eyes are more important than the clock here!). Run a silicone spatula around the edges, gradually working under the frittata until the entire thing is loose from the pan. 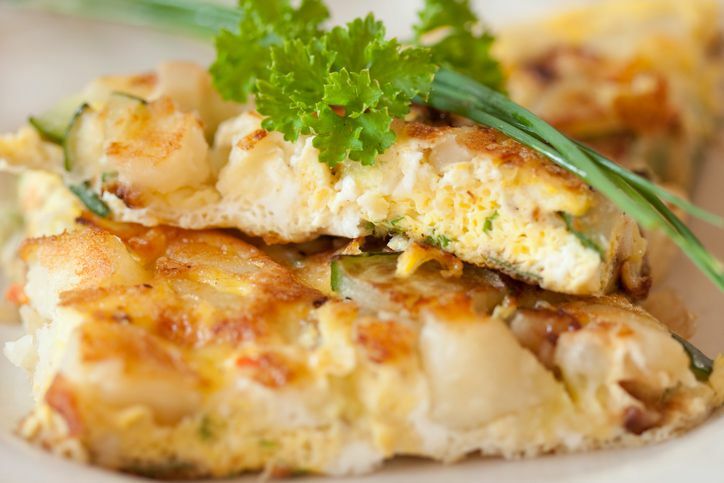 Slide the frittata onto a serving plate and serve immediately.